Esta es la mejor experiencia para los amantes de la comida que visitan Chengdu. Aproveche la oportunidad de encontrar un lugar bueno para comer explorando los callejones con un guía. No tendrá que preocuparse por los obstáculos del idioma, ya que su guía le informará sobre los diferentes alimentos que se ofrecen. Visite 7-8 puntos de comida diferentes y pruebe varios platos como fideos y tortitas. Al final de su experiencia, también disfrutará de una comida caliente con cervezas ilimitadas. Sin barreras de idioma: su guía se traducirá para usted. This tour came with a great guide that picks you up from the hotel and takes you to different areas around the city. It is a great way to taste Szechuan food! Perfect experience! Amazing Chengdu food tour! We had such a fantastic time on this Chengdu food tour! Winter was the perfect host, extremely knowledgeable about the cuisine and history of Chengdu and Sichuan, and an all-around fun guy to hang out with! Our tour consisted of a wide variety of stops to sample the most popular street foods of Chengdu. We also visited a beautiful ancient teahouse to enjoy a snack and a leisurely pot of tea in a very authentic and real atmosphere. We toured the food markets of Chengdu, visiting spice and chili stalls, sampling treats, and learning all about Sichuan cuisine. We ended the day with a fabulous hotpot experience, complete with all the ingredients one could imagine. Winter went out of his way to make sure that my vegan friend was able to experience the tour with vegan options so kindly arranged on all the snacks and restaurants we visited, and we both feel that this is one of the best, if not THE best, food experiences/tours we've ever taken part in. 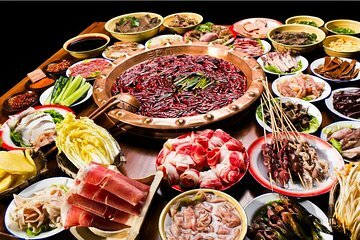 The cuisine of Chengdu is so interesting and wonderful, Winter is the perfect guide for your visit to one of the world's great food cities. He also is able to arrange interesting cooking classes, tea experiences, and more.